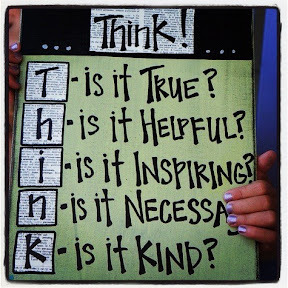 With everything floating around social media, the mainstream news and well, life, this image reminded me of a huge lesson I want students to learn - to THINK first, before they act or speak. It also reminds me of this Bible Verse - another thing I want kids to think about, especially as Tweens when they go to movies, watch DVDs, surf websites, hang out on social media and/or read books. I just wish everyone followed this rule. Hey I can dream right?